The Battle of Hastings in 1066 marked the end of the Anglo Saxon Kings of England and the Norman Invasion led by Duke William of Normandy who became King of England, also known as William the Conqueror. Duke William made careful plans for the Norman invasion. The Normans were great builders of castles and fully appreciated the great advantages that a castle would give to a fighting force. Stone Castles took too long to build so Duke William laid plans to build Norman Timber Castles when he mounted his invasion. The English did not possess a system of castles. 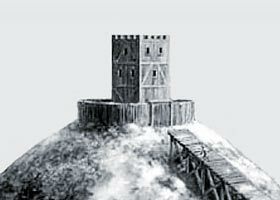 Had the English built a Castle system based on the Norman model or maintained, or modernised, the Alfred the Great Burgh Castles then outcome of the Battle of Hastings might have been very different - Duke William of Normandy would have been forced to enter into Siege warfare costing time, money and heavy casualties. His army would have disintegrated and would inevitably been forced to return to Normandy! The Norman Invaders brought Pre-Built Timber Castles! The famous Bayeux Tapestry illustrates this process! "They took counsel together, and looked for a good spot to build a castle on. They had brought with them in the fleet, three pre-built wooden castles from Normandy, all in pieces, ready for fitting together, and they took the materials of one of these out of the ships, all shaped and pierced to receive the pins which they had brought cut and ready in large barrels; and before evening had set in they had finished a good Castle on English ground, and placed their stores there. All then ate and drank, and were glad to be ashore." A number of fighting men were ready to man the castle and to take on any attackers. The wooden Norman Castle was also used to safely store supplies and equipment together with their horses. As stated by the Norman chroniclers a total of three pre-built wooden castles were brought from Normandy. So started the strategy of the Normans to build castles as their source of power in England. They initiated a programme of constructing more Timber built Castles called Motte and Bailey Castles which were then joined by the famous Norman Stone Castles of Medieval England!